Captain Chris Couch awakens at dawn aboard Ink On Paper, an Ocean Alexander 58 motoryacht moored in Anacortes, Washington. Couch looks at the sky and turns to his tablet for a glance at the weather models. The straights look a little choppy, but if he leaves now, it’ll be smooth sailing down the coast with perfect timing to hit the Columbia River bar with a flood tide the next morning. He can then navigate up the Columbia River to Portland, Oregon, his destination, by dinner. Each well-thought out, safe decision in a delivery, is a link in the chain to a safe trip that’ll put the boat through minimal stress. Essentially, Couch thinks much like a responsible boat owner who is proud and protective of his baby. But Couch doesn’t own Ink On Paper, he is a hired delivery captain who has been contracted to transport the vessel as per her owner’s instructions. The delivery captain is an often overlooked and heavily-used member of the maritime industry, an inconspicuous professional whose best mark is no mark at all. But what kind of mariner turns to yacht deliveries for a living? It turns out delivery captain backgrounds are as varied as the seas are vast. “I don’t know if there’s a rhyme nor reason of where people come from,” says Couch. “I’ve done 26 years as a delivery captain. Before this, I did a career in the Coast Guard, so I’ve been a professional mariner for a little over 40 years. I run into very few ex-Coasties,” says Couch. We pull out of Anacortes and Couch focuses on the choppy straights and plays with the throttle to make for a smoother ride. It doesn’t do to bang up the client’s boat and Couch needs to focus. Helping a friend is a common way to break into the industry, but are most deliveries referred through word of mouth? Not even close says Couch. The relationship between client and captain almost always begins with a yacht broker. The ideal triangular relationship between client, captain, and yacht broker benefits everybody. Boat owners get what they want, i.e., a boat from the broker and a vetted captain for delivery purposes. Yacht brokers get happy customers who may bring repeat business. Delivery captains earn a livelihood on the sea and gain more cred to their names. We follow up with Don Kohlman of Nordhavn Yachts for a few questions from the broker’s perspective. 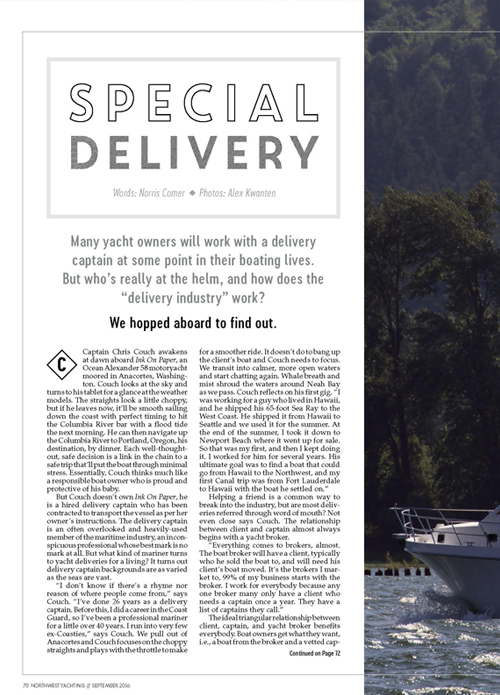 Basically, yacht brokers play the role of matchmakers and maintain a list of delivery captains that are hired on an as-needed basis for delivery gigs. Naturally, a successful delivery captain has good relationships with as many brokers as possible in order to get referrals. Marketing can certainly come into play, for it is important for a delivery captain to present his or her self as the cream of the crop. Captains tend to have resumes that detail what kinds of trips they’ve can span a boat owner’s tenure and the yacht broker has little, or nothing, to do with it. It’s pretty typical for a boat owner who has frequent need of delivery to have “their guy/gal” for the job rather than search the pool again for somebody they like and who may be a gamble. A good yacht broker who works with his or her clients after the sale of the vessel will usually share their list of delivery captains if asked. Horror stories abound in the boating community of delivered boats arriving into port with hundreds, thousands, or tens of thousands of dollars’ worth of damages from the transit. But what is avoidable and what is not? It can be hard to tell, but Couch is of the mind that good decision making avoids just about any issue. What makes a capable and brave seaman doesn’t always translate into a delivery captain who makes good decisions with the well-being of the boat in mind. Even on the delivery to Portland, we transit down the West Coast far enough offshore to avoid classic Pacific Northwest obstacles like crab traps or rugged capes. The priority is to hit the infamous Columbia River bar with the flood tide and with good weather the following morning. Couch’s policy is to transit the Columbia River during the daylight to avoid debris. He has done the trip countless times. We pass the lights of fishing vessels in the night. Kohlman echoes some of Couch’s sentiments from the yacht broker’s office. What makes a good delivery captain vs. a great one? “Someone who is organized enough to present a detailed estimate of fees and expenses, who keeps in touch along the way with us or the owner, and who takes good care of the boat. We have employed some who grab their gear and jump off the boat immediately upon arrival, and others who are extraordinarily good about debriefing and taking care of little things that may have come up during their trip.” At the end of the day, it is up to the boat owner to work with a captain that jibes with his or her style. Some captains will be more willing than others to meet a deadline, but is it worth it if the boat gets beat up? We transit the infamous Columbia River bar, the graveyard of the Pacific. We might as well have been puttering about Puget Sound with calm weather as we enter the river and pass the working docks of Astoria. The sun scatters the clouds and it’s sunglasses and smooth sailing up the river. Windsurfers dart near the riverbank and osprey nests crown the channel markers. Every peaceful mile conquered is the fruit of good, safe decision making. The purr of the engines sound like one happy vessel. “Some guys have really cavalier attitudes about their deliveries,” says Couch. He tells a story of $70,000 in damages caused by a loose anchor deployed by a delivery captain who pushed his luck with the weather off the coast of California. The skipper decided to go to beat a timeline while Couch chose to stay moored with his client’s boat’s safety in mind. Good decision making. Couch eyeballs the Anacortes to Portland route for a fair price range estimate. “Cost-wise, the trip is 350 miles. If you burn two gallons a mile, so like 700 gallons, over three days at $500 a day for captain and crew… a fair price (in this hypothetical situation) is about $3,500 to $4,000 for fuel, crew, and everything,” he muses. This is all well and good if the boat is delivered in excellent condition. We pull into Hayden Island near Portland without a hitch and tidy up the interior. Couch has a short list of things that raised his attention during the transit. One of the stabilizers acted wonky, that kind of thing. He leaves it aboard for the owner, who he’d usually debrief but who is busy at the moment of arrival. The owner says over the phone that Couch is free to leave whenever. They’ve been working together for years and the trust is palpable. Couch gathers his things, the next gig from Washington to San Francisco on his mind. Ultimately, the final screening process in the hiring of a delivery captain is up to you, the boat owner. No yacht broker’s recommendation nor captain’s confidant airs should replace your own sound judgement. The likely reason there are so few delivery captains is because the few who go the extra mile to form life-long relationships are worth every penny, while cowboy captains that cost clients a fortune don’t last long. In a very real sense, you are the captain, so be picky. Find “your guy/gal” and hang on tight.